Hello you beautiful people, it’s been too long! Well, I’m back today with a review for a book that, and this is going to sound full of hyperbole, kicked my reading mojo back into gear. Christos Tsiolkas, up until recently, was an unheard of author, to me. However, that is just a product of my ignorance as he is well known in Australia and has achieved great success. Recently, I was in Australia visiting family, and of course, when I see a bookshop, I HAVE to go in. I was browsing around and this book just popped out to me. Maybe it was the cover, maybe the simple title, or maybe it just happened to be in my line of sight… Well, I took a gamble, and unlike in the casino, it actually paid off! Set in contemporary Melbourne (Australia), The Slap centers on a family/friend barbecue and a series of events that leads to the titular “Slap”. Now, this slap is given by an adult to a 4 year old. Harsh, you might say… Well deserved, you may also say… It is this act that reverberates amongst all the guests, both for those that are on side, and those that disagree. Lives will never be the same again, secrets are exposed, true colours begin to shine through. The format of the story is frankly nothing new; the back and forth chapters that are told from various perspectives are common place, especially with authors such as Jodie Picoult and Liane Moriarty. However, in this case, it really works and is not overused. Plot aside, it is the characters that really kept me glued to the page. Set in contemporary Melbourne, we are presented with composite of contemporary society and issues including, race, identity, drugs, sexuality, and immigration. Each character is so fully fleshed out, that they could easily each have their own book and story. In fact, the one negative to this book is that it left me wanting more, a lot more – and that’s saying something considering the book is almost 500 pages. 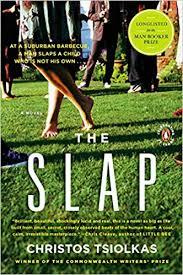 If you want to check out a new author, read a story that will stay with you for a long time afterwards, take you on an emotional roller coaster, then you could do a lot worse that picking up a copy of The Slap. Well, I’m off to continue reading another Tsiolkas novel!